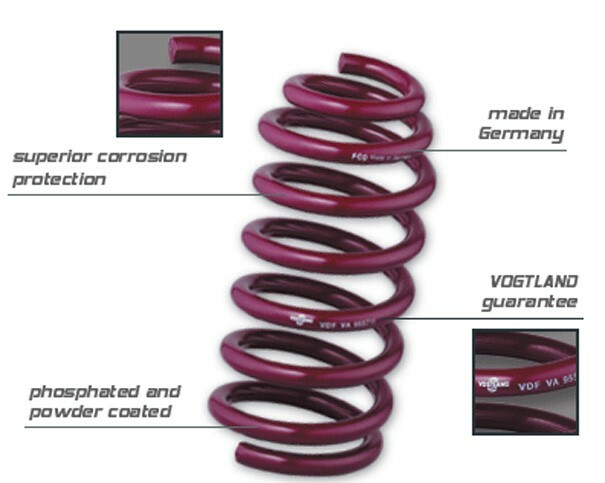 VOGTLAND sport spring sets made in Germany give your car improved dynamic handling, better cornering and a dynamic appearance. This means better appearance with maximum driving comfort in normal operation and sporty, progressive tuning at the operating limits. The special driving dynamics are achieved by the innovative spring design. The reduction of the spring travel demands a specific spring characteristic, derived from Motorsports. 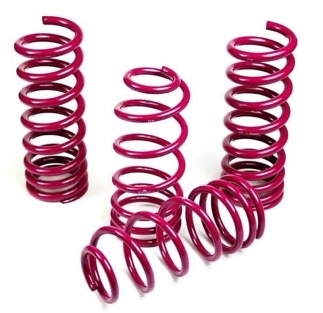 The VOGTLAND-Compound-Spring consist of two different spring rates: a starting and an end rate. These are specially calibrated for every car model balanced and interacting characteristics stand for a well-balanced driving comfort and more sportive dynamics.